The Princess Slide Ball Castle is any little girls dream come true. You have got to hear the squeals of delight, as the castle is inflated, to believe them. The kids and adults are stunned as to what a great castle they have for their party. With the legendary inflated Throne, side windows, bench seats and ball pond, this is any Princesses wonderland! The sizing is manageable for most gardens and the roof keeps the harsh summer sun off and in winter the castle is cozy. 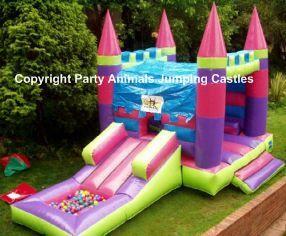 This castle will wow your kids and friends and ensure that your party will be the success you deserve. The “coloured fun balls” that goes into the ball pit can be rented separately with the castle. There is +-200 balls per bag. The motor is a 1.1kw motor with a 15m extension lead. If your power point is further than 15m form where the castle will be place you will need to supply an additional extension lead. These are not provided by Party Animals.